Using the blade angle, stroke path, and shaft angle to make the board go in a straight line and propelling yourself forward more efficiently. 3) Blade path: starting the stroke slightly away from the rail and pulling the paddle in towards the feet, ending the stroke close to rail by your feet. 4) A bonus tip that is not included in the video is rail steering. 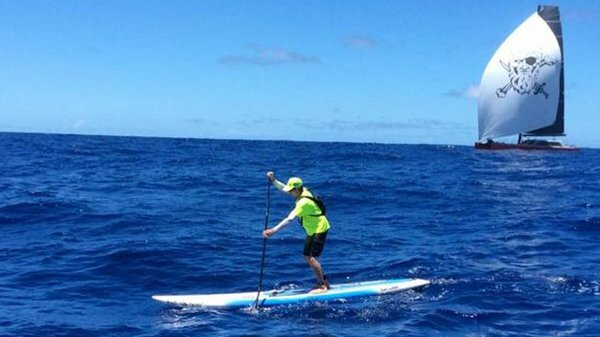 To go straight while standing in the middle of the board, you want to keep the board flat on the water or slightly un-weigh the side you are paddling on to keep it going straight. Putting more weight on the side you are paddling on will make the board turn faster (i.e. if you put your weight on the left rail, the curve of the rail in the water will make the board veer to the right). So you want to avoid the common beginner mistake of putting more weight on the side you are paddling on and instead keep your weight balanced equally over both feet. To keep the weight balanced while leaning the top hand over the rail to get the vertical paddle angle mentioned earlier, your hips have to move to the opposite side to keep the weight balanced evenly over both feet. By using your strength to power yourself forward instead of sideways, you will waste less energy, making your stroke more efficient and you spend less time switching sides with with the paddle, which keeps you from loosing forward momentum. Please also check out our other SUP Tips and subscribe to our youtube channel to watch our latest videos posted weekly. Aloha!